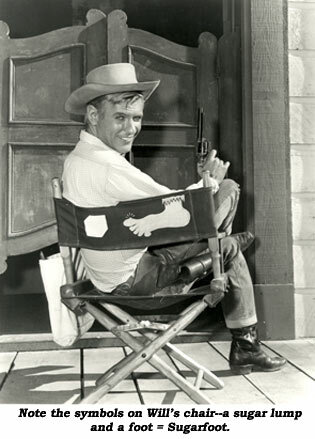 Will Hutchins on Charles Bronson, Jean Simmons, Barbara Stanwyck, personal appearances. Howdy! Human kind’s greatest common fear? Not death, nor taxes, flying nor falling, spiders nor snakes—nope, the big scare we all share is getting up in front of a room of strangers and making a speech. Shucks, I’d rather go to a one-armed dentist. So, when my wife Babs informed me she’d accepted an invitation from the local Kiwanis Club for me to give a little talk, I did what any red-blooded son of the sage would do—I packed my bags for Port Au Prince, Haiti! Cut to the chase—driving to the Kiwanis dinner on that fateful night, I growled at Babs, “Well, here’s another fine mess you’ve gotten me into!” Good wine and strong coffee soothed a savage beast, and whee! I shifted into a silly mode. At the dais I was a mellow fellow starting off with one-liners, a magic trick and a sea chantey. I had ‘em rollin’ in the aisles—whatta crap game! As I sequed into a brief run-thru of my career, Babs produced a stack of 8x10 glossies, in no particular order, depicting highlights of my life in showbiz. Babs held the pictures up for all to see and I’d ad lib on them. Then she passed them around for closer viewing, but as we all know, no man’s life bears close inspection. The first photo, about forty years old, was a still from a “Sugarfoot” featuring Charles Bronson and me trapped in a coal mine—we spent most of the show in that mine, and for all I know we’re still down there. Talk about your low budgets. I long maintained that on some of our shows instead of Will Hutchins, Col. J. C. Warner should have played the Canary Kid (cheep, cheep). Anyhow, there were Charlie and I in the picture—shafted. Bronson was very good in his role, much better than I. My part called for heavy emoting. In those days I only had two expressions: hat on, hat off. Bronson was mightily strong. He could grasp his saddle’s pommel and slowly ease himself off the ground and onto his horse in one fluid motion without using his stirrup. He was more ominous than Jack Palance in “Shane”. I fondly remember several sweet, surprise visits to our crummy set by beautiful Jean Simmons. She was working on a feature on the next door sound stage—yessir, I remember Jean Simmons! But she never came to visit me. Next picture Babs, if you please—Ah! Barbara Stanwyck and I on borrowed horses outside the L.A. Coliseum ready to make our entrance at the Sheriff’s Rodeo on a Sunday in August, 1958. I was the Grand Marshal, and Barbara was the Queen. She was resplendent in black in the sun. Missy sure know how to find her key light. In those days I hated my buster brownish Sugarfoot outfit. Looked not unlike a reject at a garage sale. So for this auspicious occasion I bought a brand new outfit at Nudies: a big white hat with a high crown, a zooty blue and white checkered shirt, a flowered bandanna, plus my own private shotgun chaps. As I was ridin’ round the Olympic track I spotted one of Warner Bros.’ top TV suits with his family in the front row. I gave him a cowboy wave. His smile froze, his skin turned ashen. A few days later I received an inter-office communiqué. He said I looked like Howdy Dowdy in those duds, and if I persisted in such tomfoolery I would henceforth be barred from all future personal appearances. Shudder! Heh, made no nevermind to me. Money changed hands on all those Warner Bros. P.A.’s back then, but the big boys didn’t quite get the hang of the trickle down effect. Meanwhile back at the rodeo, toward twilight I posed with Barbara, Johnny Cash, and Sheriffs Biscailuz and Pitchess on horseback. Next day, on the front page of the “La La Times and Throwaway”, the picture appeared, but I was cropped out! Not only that—the ‘rodeo critic’ gave me a bum review. Imagine that! A bum review for a rodeo.